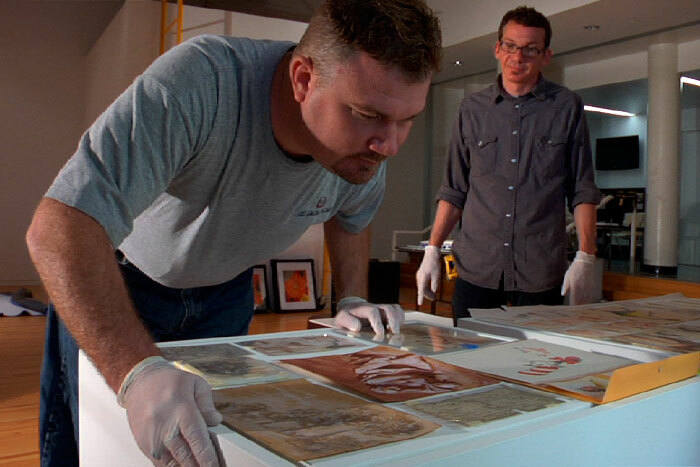 The discerning eye – Matt Leininger uncovering Landis in Art and Craft. The Art Sleuth here greeting you on a cold Sunday morning in Cincinnati, Ohio. Art and Craft (artandcraftfilm.com) has been doing extremely well here in the US. Opening in new cities every Friday since September 19, Art and Craft comes to Cincinnati this Friday the 24th at the Mariemont Theatre. I will be doing a question and answer session after the 730pm screenings on October 24 and 25. If you cannot see the film in theaters, you can now pre-order Art and Craft at iTunes (https://itunes.apple.com/us/movie/art-and-craft/id917816859?ign-mpt=uo%3D4). 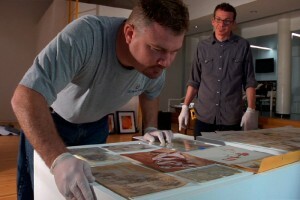 I also wanted to share this blog from the American Institute for Conservation (http://www.conservators-converse.org/2014/10/the-movie-art-and-craft-a-conservators-perspective/). A very well thought out piece from the blogger! I will keep you posted on any new findings on Mark Augustus Landis as I am in my seventh year now tracking him. I just saw the film. I am intrigued by the question of whether Landis’s actions have been harmful, or not. The passion displayed on this very page is proof that others are intrigued as well. Speaking of due diligence let me say up front that I have not read the piece in the Financial Times, nor in the New Yorker. I’m hoping that these sources will help me get a handle on the issues. For now, though, I can say with certainty that I feel Landis is a dyed-in-the-wool con man. It is amazing the way he lights up in the museum reception scene. One can sense immediately how a museum curator might be taken in. If he is a con man, one can easily find nature or nurture arguments which attempt to explain why this is so, but the fact remains that at the end of the day, we are responsible for our actions. It is simply wrong to defraud others. To fault Leininger because he insists that Landis is a con artist is absurd. A question which I hope to resolve by further research is how the big media reported this story, i.e., in what tone, in what depth, and what conclusions they drew, if any, about the case. The film was rather coy about drawing conclusions. They certainly could have made professionals at the major institutions squirm far more than they did. Yet this part of the story (how DO you authenticate artwork?) went unexplored. This lack of reporting on what institutions should have been doing makes Leininger’s taking up the slack more understandable, a point that is made in the film but rather weakly. Landis’s personality, as odd, wandering, and fractured as it is, makes for a compelling subject, and the filmmakers used this to their advantage. The question arises as to whether they were themselves exploiting Landis. I wonder. At the very least, they cast Landis as an idiot savant, which I think is only one of his facets. They certainly let him play to the camera. On the other hand, the filmmakers left plenty of film running so that viewers could make up their own mind as to the man’s character. As I have said, my conclusion is that Mark Landis reveals himself in the film to be an artist, after all. A con artist. I watched the film last night, and am struck by Mark Landis’ comment that we are all different, and all the same. There is so little separating us, the line between art and craft is implied to be one of integrity, but Mark clearly has a sense of doing something right, though he must come close to lines he knows will cross over into “wrong”. At the end of the film he works out a new strategy, apparently, where he does as asked and stops donating “famous” pieces to museums, but now will simply return lost items to their owners. All human interaction is a kind of theater, and hard work in many ways. With both of the M.L.s I saw struggle, and a degree of success, in bridging the distances that isolate and challenge us. If art is an artifact that makes us consider our humanity, then Landis, as well as the filmmakers, Cullman, Grossman and Becker, certainly succeeded. Just watched Art and Craft. The salient bits of this film reveal a lonely, mentally challenged, but very talented and likeable man who is at least as smart as, if not smarter, than the target museums and other institution snobs who profess to champion and know so much about fine art (like the guy from the Cleveland Museum–“right out of central casting,” Landis says). The real fraud exposed by this film is not Landis, though. It’s the cabal of mediocre, ill-informed or, worse, lazy staff, faculty, etc who run these art museums/institutions who were duped for 30 years!Frames purchased at Wal-Mart?! Digital copies that were simply painted over?! Landis has exposed these people for who they are: bitter, posturing hacks with more ambition than knowledge or talent. Naturally, a man like Landis would raise some hackles. All of the offended (embarrassed)–the hyper-educated art “experts”–were outwitted by a timid, reclusive loner with limited social skills, schizophrenia, and a high school education. THAT’S the real issue here! Does anybody else see that? Leininger is no hero. He comes off like a floundering bully with not much going for him. What exactly was he pounding his chest about Landis for? Who is he protecting? The phonies in the art world who clearly can’t even tell a blatant fake when they see one? The public? If Landis stops, what really changes? I’m a huge art fan, and I applaud Landis for his creativity, ingenuity, and balls. I hope he was paid and paid well for his participation in this film. The true fraud he helped expose is far more valuable to society than the ridiculous “cons” he pulled off! Christina Casey is clearly fooled by the deceptively charming facade of an extremely mentally ill man. Her gullibility is almost as scary as her inability to distinguish right from wrong. Landis wasn’t being gracious, he was trying to avoid admitting responsibility. He needs to be in a group home, somewhere where he can be supervised and prevented from harming himself and others. Matt Leininger is a hero for standing up for the truth. As usual, no good deed goes unpunished. What kind of person is Matt Leininger, who hunts downs and says he’s going to “get” Mark Landis? When Mark Landis is a harmless elderly man who is autistic, and has a host of other mental diagnosis’s, and in nobody’s care, and with no living family members (as you might see in the documentary Art & Craft. If it werent for Mark Landis, who was very gracious to Leininger, he would have no extra attention at all.